Are you looking for inspiration for your next protective style? Have you been searching all over Instagram, Pinterest, Facebook, and YouTube looking for your next protective style for the fall? Look no further. Goddess locs have been the hottest protective style all summer and I see it going strong for the fall and winter months as well. I don’t see this trend going anywhere anytime soon and I am here for it. Goddess locs are sleeker than faux locs with a curled finish on the ends. You can thank trichologist, salon owner, and celebrity hairstylist Dr. Kari Williams for creating this super cute style. I remember first seeing this look worn by Meagan Good, who was styled by Dr. Kari Williams. When I first saw goddess locs I instantly fell in love with them, because the style is softer, wavy and more chic look than regular faux locs. Plus, the style looks amazing on anyone who wears it! I found that there are two ways you can install goddess locs. You can install the individual goddess locs or install crochet goddess locs. Goddess locs are known to last up to three months with proper maintenance. You should moisturize your scalp and protect your hair at bedtime, but I wouldn’t advise washing them, because it will cause frizz and loosen the locs. You can opt for a stylist to achieve this look, but if you DIY, here are some tips. Make sure your hair is clean, deep conditioned, and well-moisturized so that you can get the most out of this style. As I stated earlier, you can either install individual goddess locs or crochet. Either way is cute, but choose the best option for you. If you go with individual goddess locs, you will need to choose two types of hair. The first hair that you will use will be for the base of the goddess locs, which will be a wavy texture. Marley hair will be the second texture that is wrapped along the hair shaft to form the loc. Check out Donedo’s video on how she achieves flawless goddess locs. If you choose to do crochet goddess locs, you will need to braid your hair underneath and then proceed to crochet the locs in. You will use pre-made crochet goddess loc hair for the crochet style. Check out this video on how to install crochet goddess locs. I love wearing different styling options when I do any protective style. There are so many ways that you can rock your goddess locs: a bun, half up half down, ponytail, or low bun. The choices are just endless. Check out how Donedo styles her gorgeous goddess locs. What do you think of goddess locs? 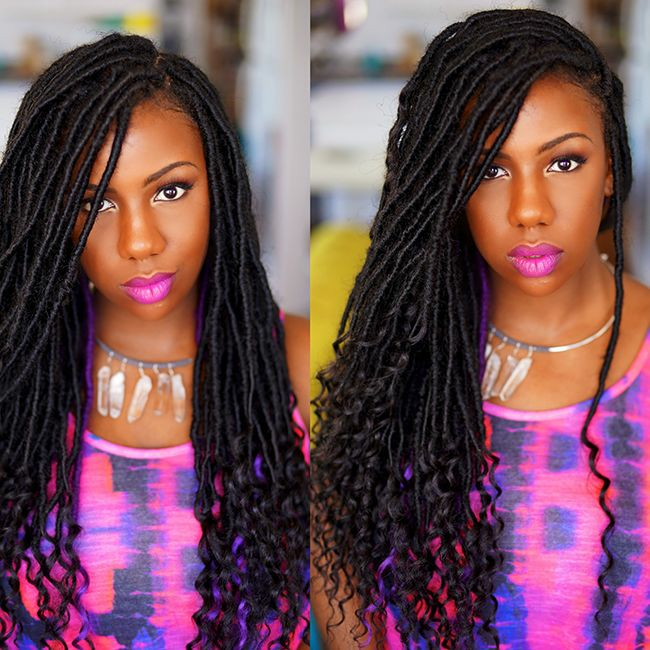 Will you try goddess locs for your next protective style?